German plastics and rubber machinery exports to India fell for the second year in a row in 2013, reaching a total of EUR 87m, down by almost 50% over 2011 (EUR 175m), reports the German association for plastics and rubber machinery, VDMA Kunststoff- und Gummimaschinen (KuG, Frankfurt; http://kug.vdma.org), ahead of the “Plastindia” fair (www.plastindia.org), held in Gandhinagar, Gujarat, from 5-10 February 2015 (see also Plasteurope.com of 21.10.2014). Exports fell by almost 26%, meaning the decline was less drastic than that of 2012 – when deliveries caved in by almost 33% – but is still a far cry short of the close to 30% increase in deliveries registered in 2009. VDMA’s figures show that Germany remains the second most important supplier of plastics and rubber machinery to the subcontinent, on the heels of China – which exported machinery to the tune of close to EUR 125m in 2013. Third spot goes to Japan, at about EUR 50m. 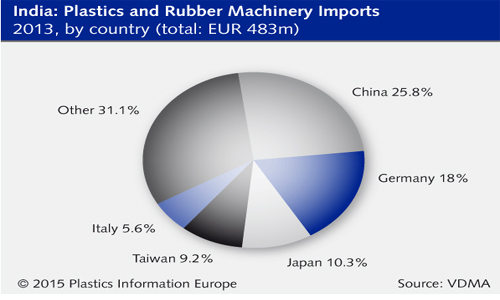 Taking all global exports of plastics and rubber machinery to India into account, the German association found that their value dropped by 25% year-on-year in 2013, reaching EUR 483m. The biggest losers were France (down 56.5% over 2012), Italy (down 39.8%) and Japan (down 38.5%). At 0.9%, the only country that was able to slightly lift its machinery exports to India in 2013 was South Korea.